The Specials featuring Rico were the first to do it, Queen Latifah and Del La Soul, together, did it 11 years later, Nick Cave & Kylie did it five years after that. Queen have done it four times but Florence and the Machine have done it the most, nine times so far. Done what? Used the + symbol in the artist credit. A few others have done it as a one-off and Ed Sheeran has certainly had the most success with it for his 2011 album title. 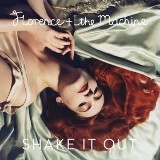 This week I’ll be focusing on Florence + the Machine’s 2011, number twelve hit, Shake It Out. Before long, the band grew and its line-up was guitarist Robert Ackroyd, bass player Mark Saunders, harpist Tom Monger and drummer Chris Hayden. They released their debut album, Lungs in 2009 which went to number one and spent 155 weeks on the chart. In 2010 they released four stand-alone single including the number two hit You Got the Dirtee Love in collaboration with Dizzee Rascal. Their second album, Ceremonials, came in 2011, a title which was inspired by some 70s video art, Florence explained, “Years and years ago, I saw an art exhibition and there was this video art piece called Ceremonials. It was made in the 70s and was done in Super-8 and is kind of Coquette-sy – there’s that documentary called Coquette about this 70s theatre troupe that lives in San Francisco and I came kind of obsessed with it.” The lead single was What the Water Gave Me which peaked at number 24. The follow-up, Shake It Out, halved that and peaked at number 12. The accompanying video was partly inspired by the album’s title, “ceremonies got stuck in my head,” Florence said. It was filmed at Eltham Palace in South East London and depicts Florence attending an old-fashioned masked ball, similar to something like The Great Gatsby. “We were kind of going for a sort of ‘Gatsby at West Egg’-style house party but with maybe slightly ritualistic and sort of satanic undertones and séances,” she explained.